South Korea's Defense Minister Han Min-koo warned Tuesday that his country will launch a pre-emptive strike if there are clear signs of an imminent North Korean missile attack. His remarks came two days after the communist state fired another ballistic missile, which it claimed was a mid- to long-range missile capable of carrying a "large-size, heavy" nuclear warhead and targeting the continental United States. "Our position is that we can launch a pre-emptive strike to reduce damage on our side if there are clear signs of an imminent North Korean missile attack," Han told a session of the National Assembly's National Defense Committee. Han was referring to the North's possible attacks using short-range Scud or mid-range Rodong missiles. Scud missiles with ranges of 300-500 kilometers are seen as targeting South Korea, while Rodong missiles with ranges of some 1,300 km can put Japan in their crosshairs. 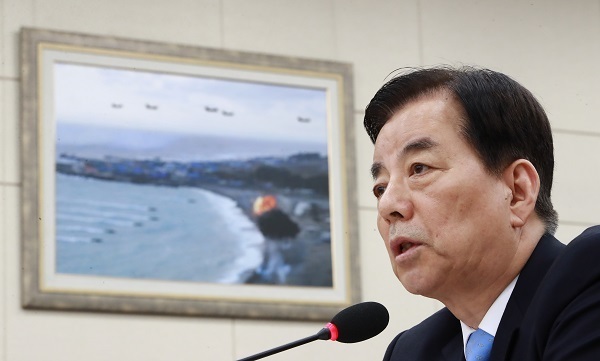 During the parliamentary session, Han noted that the South Korean military detected the early signs of the North's latest missile provocation, and that both Seoul and Tokyo have shared the assessment that the missile was an intermediate-range missile rather than an intercontinental one. Asked about the possibility of the United States having carried out cyberattacks to thwart Pyongyang's past missile launches, Han gave a negative answer. After a series of the North's failed missile launches, including two last month, speculation has persisted that Washington might have employed the "left of launch" strategy that mobilizes cyber or electronic warfare tools to neutralize hostile missile threats. "We have checked the possibility (of the strategy). ... We believe it is possible in theory, but it is very difficult (to use the technology in military operations) at this point in time," Han said.